how are things? Did you have a lovely weekend? I hope you got to relax and create a bit. I've had quite a few projects on my mind lately, but I very reasonably decided I'd better clean and organize my studio before I get consumed with yet another project :). I was quite stunned at the amount of finished itmes I found spread all around my studio, so I decided it was time for yet another Handmade Sale. This is just a sampling of what's up for grabs. I've listed pillows, bags, quilts, and lots and lots of pouches in my etsy shop. Oh, and I listed some quilting and sewing books from my personal library as well. 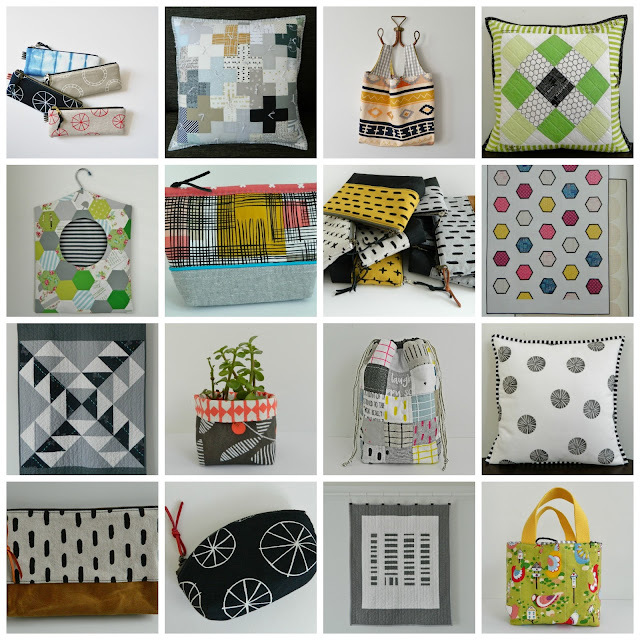 This will be the last Handmade Sale this year, so I hope you'll find something you like. Any questions? Just leave a comment below or send me an email. 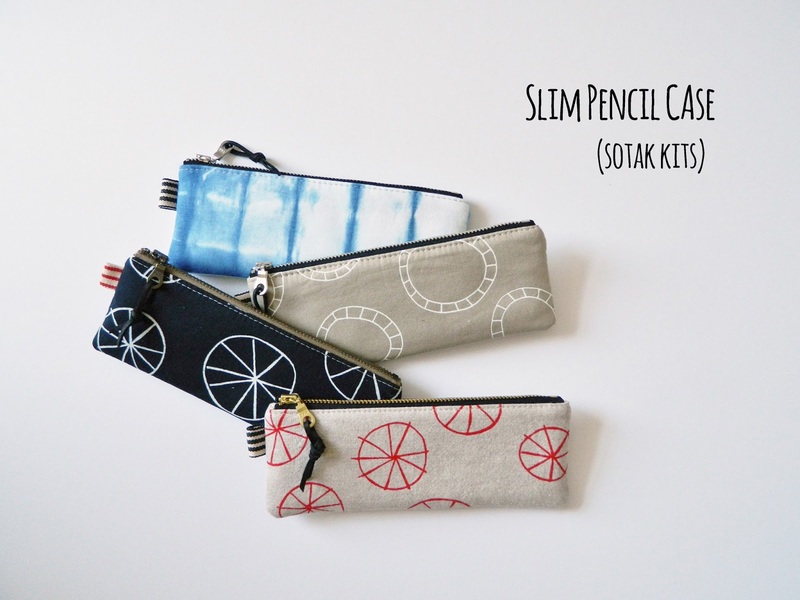 I'm super happy to show you my newest pouch - Slim Pencil Case. It's a simple super slim pouch, perfect to keep the few pens and markers I carry around in our purse organized without adding any bulk. The pouch finishes at 7.5" x 2.75" and is nicely padded thanks to the addition of fusible fleece. And, most of all, I no longer have to fish through the contents of my bag every. single. time. I need a pen. Sheesh, I should have made these ages ago!!! 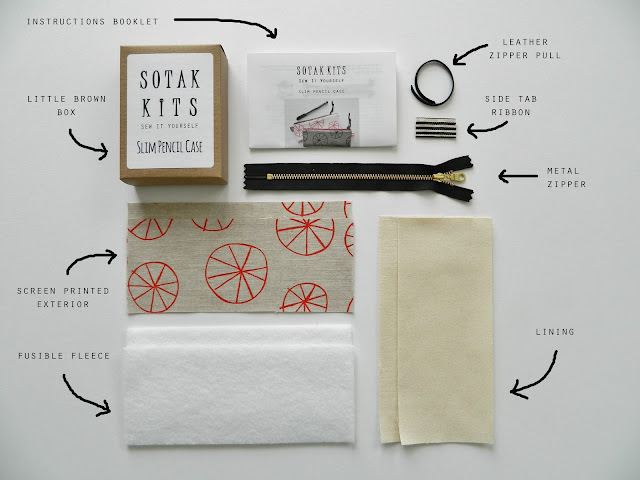 I loved my pouch so much, I decided to put together a few kits for you as well. 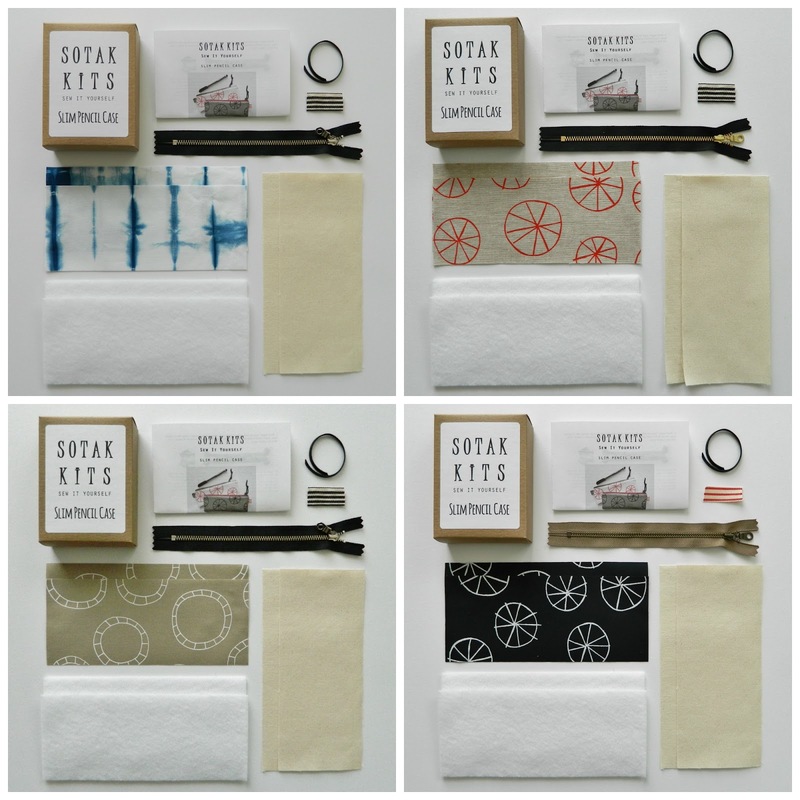 I had great fun choosing supplies for each kit. I hope you like my combination of screen printed fabric, metal zippers, striped side tabs, and leather pulls, all beautifully packaged inside the little brown box. 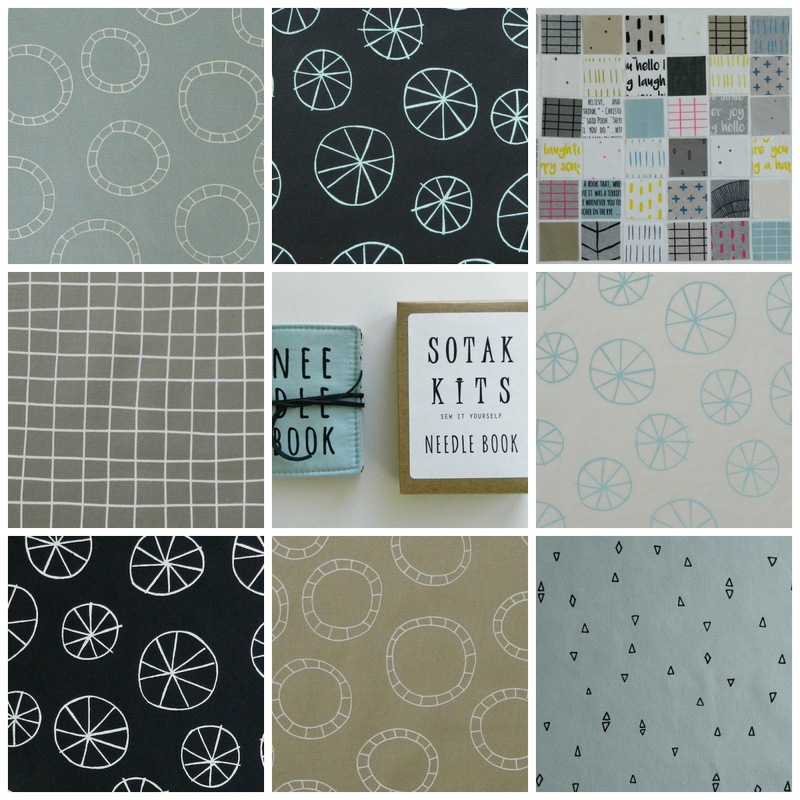 All these kits are now listed at my etsy shop in case you'd like to grab one, or a few ;). It seems my quilting mojo is coming back and I once again find myself drawn to my overflowing scrap bin :). Yay!!! I should really be working on my newest bag pattern, but I'm learning to just go with the flow and allow myself some fun, no deadline sewing. I'm sure once I get this quilt out of my system I'll be ready to get back to what needs to be done. Fingers crossed. These are just simple 2.5" squares pieced together in a 4 x 5 grid. I think I'll add a low volume border all around to make this quilt top a bit larger. And then I'm looking forward to spending many cool evenings slowly hand quilting this guy. I'll keep you posted on my progress. I've always greatly admired whole cloth quilts. I love their minimalist non fussy look, and I especially love that the stitching is what makes these quilts. And, after planning and plotting for way too long, I finally have a whole cloth quilt of my own :). It all started rather simply. Just two Ultra Soft twin sized flat sheets from Target and some batting I had on hand. I first washed, dried, and ironed the sheets and removed all the finished seams along the edges. I then used 505 basting spray and basted the two fabrics and batting the same way I would any other quilt. I used a 1.5" wide yardstick and water soluble fabric pen (the blue side) to mark all my lines. This, I must admit, was my least favorite part of the process but it had to be done as I wanted nice straight lines along the length of the quilt. And then the fun started. 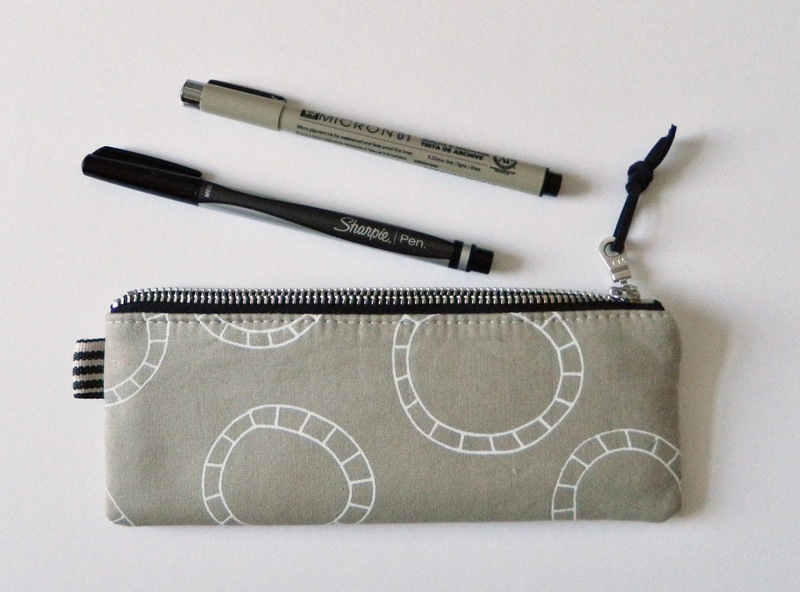 I used perle cotton in light shades of gray and beige and I stitched and stitched. I don't use any hoops or frames when I hand quilt, I just plop myself on a couch with basted quilt in my lap and simply go for it. Once the quilting was all done (which wasn't a quick process at all as it took a few weeks for me to get it done), I trimmed and squared up the quilt. I then machine stitched one side of the binding on, flipped it to the other side and hand stitched it in place using simple running stitch. I then washed and dried the quilt and absolutely adore the final drape and feel of this quilt. Even my kids, who are not huge fans of regular quilts, love this one. finished size: 61" x 88"
Hello, happy October to you all! I just wanted to pop in real quick to let you know I've added lots of new goodies (sewing kits as well as screen printed fabric panels) to my etsy shop. I hope you'll stop by to have a look and maybe find something you like :). And, to make things more fun, I have a discount coupon code for you today. Use FALL10 during checkout and a 10% off discount will be automatically applied to you shopping cart.